It’s been claimed that 70% of cannabis users are tobacco smokers or have at least smoked it in conjunction with marijuana at one time or another. Cannabis and Tobacco have long been used throughout the world for centuries and are part of many cultural traditions, spiritual rituals, and common practice. They are often used together whether mixed or one after the other. Today’s Smoking Analyst have made claims that 70% of cannabis users are believed to be smokers or have at least smoked tobacco in conjunction with marijuana at one time or another. Many people who light up enjoy both cannabis and tobacco for their synergistic effects (synergistic meaning the two working together to produce a different outcome). Some marijuana smokers report that smoking cigarettes after a toke give them an increased “high” feeling while others state that they smoke to calm down from early onset of marijuana because they feel too anxious or racy from the psychoactive properties of THC. Given this, many choose to mix and match a blend of both in their favorite preference of rolling papers… Maybe you’re more for the tobacco as it may relax the muscles, ease the mind, or reduce tension and stress? Or maybe the cerebral heady or hefty body high that creeps on with more grass than tobacco is what you’re after? Either way, by mixing and matching these choice blends of chemicals people suggest they can reach a middle ground for their desired bell-ringer buzz. It must be stated however that each person is different dependent on tolerance and regular use of both these chemicals. The Hippocampus of the brain is a central headquarters for interlinking processes of sensory stimulus, the reward system, and addiction. This area of the brain is also associated with memory functions and links to the control of inhibition. This part of the brain is central to how tobacco and marijuana affect the bodies central nervous system and mental functioning due to its linking with antagonist (activating) receptors such as cannabinoidal receptors, nicotinic receptors, and opiodal receptors. While effects vary when the chemicals are mixed there are some major differences between the two’s overall side-effects. Studies have found that marijuana reduces the size of the hippocampus and can create memory loss. Strangely enough, it has been found that tested regular smokers who smoked more had better improvement in memory than cannabis users — however, and a big however — one not to be overlooked — tobacco and all of its carcinogenic chemicals are known to cause cancer, while more recent studies show proof that marijuana’s CBD cannabinoid is known to fight off cancer cells and work against many other diseases. 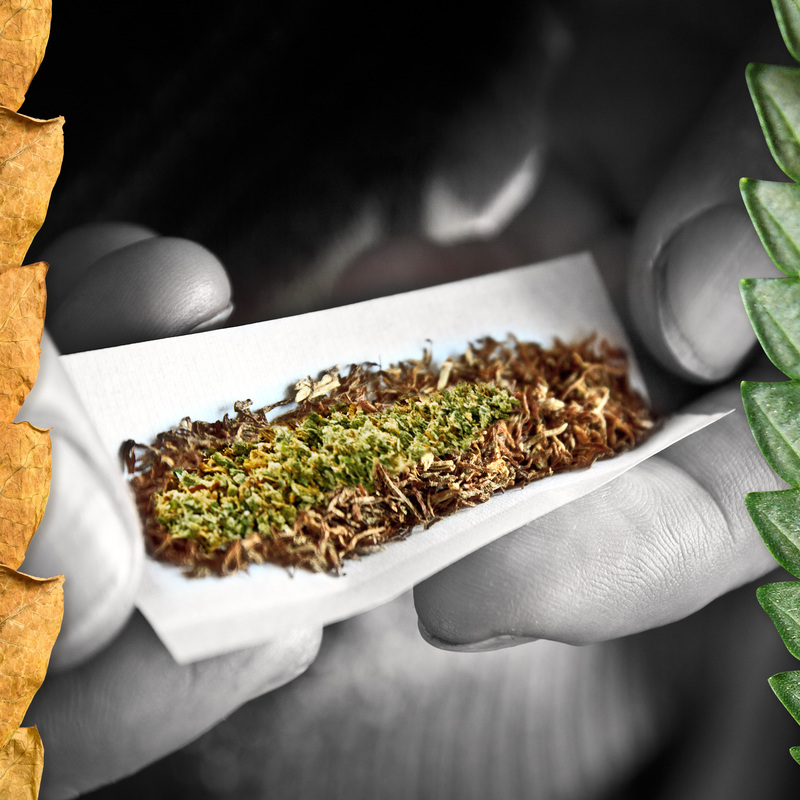 How do you feel about cannabis and tobacco together? Hit us up on social media or leave a comment below and tell us what you think.